Share markets were mixed over the last week as global growth worries continue to impact. US and Eurozone shares rose a bit, but Japanese and Chinese shares fell in lagged response to the previous week’s falls in the US and Europe. Australian shares were little changed. Bond yields generally continued to drift lower, commodity prices were mixed with oil and copper up but gold and iron ore down and the $US rose which left the $A little changed. Share markets saw a strong rebound in the March quarter with US shares up 12%, global shares up 11% and Australian shares up nearly 10%. For Australian shares this makes it the best 3 months since September quarter 2009. Of course, this was after a huge plunge in the December quarter which saw investors get too negative and it still leaves markets below last year’s highs. Continue to see share markets moving higher by year end, but expect much slower gains from here and after the huge rise since their December lows shares are vulnerable to a short term pull back particularly as global and Australian economic data remains soft. Five reasons not to be too concerned by the latest plunge in bond yields and a negative yield curve. First, while a negative yield curve has preceded past US recessions the lag averages around 15 months, there have been numerous false signals and following yield curve inversions in 1989, 1998 and 2006 shares actually rallied. Second, other indicators are not pointing to imminent global recession. In particular we have not seen the sort of excess – overinvestment, rapid debt growth, inflation, tight monetary policy – that normally precedes recession. Third, bond yields lag shares with the bond market catching up to last year’s growth scare that depressed share markets. Following the February 2016 low in shares bond yields didn’t bottom until July/August 2016. Fourth, the retreat from monetary tightening has been a factor behind the rally in bonds but this is actually positive for growth. Fifth, part of the reason for the rally reflects investors unwinding expectations that central banks would continue pushing towards tightening. What the decline in bond yields reminds us though is that the constrained growth and low inflation malaise seen since the GFC remains alive and well. The latest plunge in bond yields will keep the “search for yield” going for longer which is positive for yield sensitive investments like commercial property and infrastructure. That said if the momentum of global data – particularly global business conditions PMIs – doesn’t soon start to stabilise and improve as expected then the decline in bond yields will start to become a deeper concern. Either way share markets remain vulnerable to a short term pull back. Brexit took another twist over the last week with the UK Parliament taking control, but via a series of indicative votes, confirming that there is (as yet) no majority support for any one option. However, its not as bad as it looks with the votes indicating little support for a no deal Brexit, a soft Brexit looking preferred and some support for putting the preferred options to a referendum. If the withdrawal agreement in PM May’s deal finally gets supported Britain will likely exit on May 22 but if not the UK will have to decide to ask the EU for a long extension or to crash out on April 12. Going by the indicative votes a long extension is more likely but this opens up a hornet’s nest of the UK participating in EU elections in May, new UK elections and another referendum. But just remember that the Brexit comedy is just a sideshow for global investors. What happens in the Eurozone is far more significant to us (sitting here in Asia) than is Brexit. The Australian Federal Budget to be handed down on Tuesday will have three obviously overlapping aims: to provide a fiscal stimulus in the face of flagging growth; to reinforce the Government’s budget management credentials by keeping the budget on track for a surplus in 2019-20; and to help get the Government re-elected in a most likely May 11 or 18 Federal election. In all of this it has been helped by a revenue windfall mainly due to higher corporate tax receipts on the back of higher commodity prices but also higher personal tax collections due to stronger employment growth and lower welfare spending, although this will be partly offset by reduced growth and wages forecasts for 2019-20 and 2020-21. This is likely to see the budget running around $5bn better than expected in the December MYEFO for 2019-20. However, given the need for a fiscal boost in the face of an ailing economy and pre-election sweeteners the Government is likely to “spend” the bulk of the revenue windfall. We expect around an additional $6bn pa in personal tax cuts (including the roughly $3bn pa already allocated for tax cuts in December’s MYEFO ie under “decisions taken but not yet announced”). Coming on top of the $3bn pa of tax cuts already legislated for following last year’s budget this is expected to result in total personal income tax cuts of around $9bn pa from July. These are likely to be skewed towards low- and middle-income earners. The additional tax cuts could involve some combination of bringing forward some of the 2022 tranche of already legislated tax cuts and a further lift in the Low Income Tax Offset. There are also likely to be one off cash payments to pensioners, an expansion of the instant asset write-off and extra spending on health and infrastructure. Key Budget numbers for 2019-20 are expected to be: a budget surplus of around $5bn after budget handouts (or $10bn before any stimulus), real GDP growth of 2.5%, inflation of 2.25%, wages growth of 2.5% and unemployment of 5%. 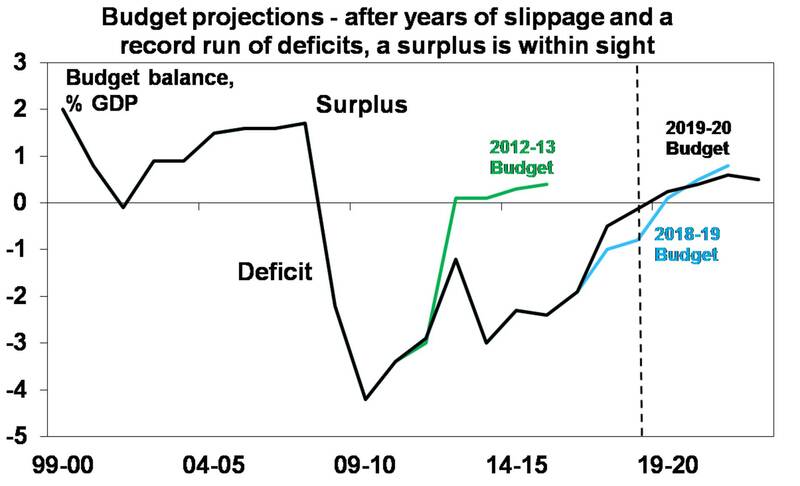 The deficit projection for 2018-19 is expected to be $1bn up from $5.2bn in MYEFO. US data was a mixed bag with a fall in consumer confidence albeit its still solid and falls in housing starts and pending home sales but continuing gains in house prices, falling jobless claims and a reduced trade deficit indicating that trade will likely contribute to March quarter GDP growth. ECB President Draghi and various ECB officials made various dovish comments pointing to: more generous terms for the next round of cheap back financing (TLTROs); the ECB standing ready to ease further if needed with the full range of instruments available; and the ECB considering applying negative interest rates on bank reserves only above a certain level rather than on all reserves. The latter is designed to encourage banks to lend out more but not penalise them for keeping required reserves. Meanwhile economic sentiment readings provided a confusing picture. Australian job vacancies rose 1.4% over the 3 months to February suggesting the jobs market is still strong and growing but momentum has slowed from 5.2%qoq a year ago and annual growth at +9.9%yoy is slowest in 2 years, indicating that jobs growth is likely to slow. Meanwhile growth in private credit remained modest in February with investor credit stalling and slowing to a record low of just 0.9%yoy. Household wealth is reported by the ABS to have gone backwards in the December quarter by 2.1% as house prices and share markets fell. Since then share markets have bounced back but house prices have continued to fall. 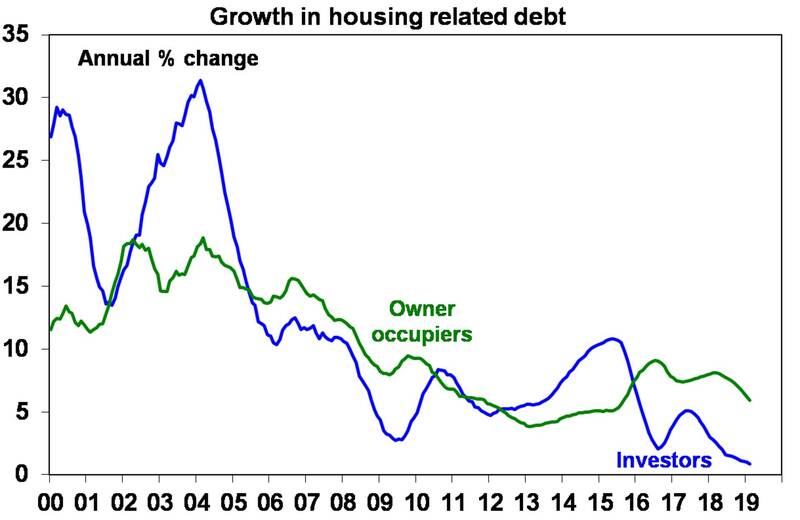 With the RBA estimating that each 10% decline in net housing wealth knocks around 1% off consumer spending falling house prices will act as a significant drag on consumer spending in the year ahead. Of course, the Federal Budget will try and offset this with tax cuts, but interest rate cuts will also be needed. And on this front there is some good news as falling bank funding costs should contribute to lower mortgage rates. From a high earlier this year of around 0.59% the gap between the 3 month bank bill rate and the expected RBA cash rate has fallen to 0.32% pointing to scope for the banks to reverse the 0.1-0.15% mortgage rate hikes they put through in response to rising funding costs around last August. However, just as last year’s hikes lagged the spike up in funding costs any cuts will likely lag the recent fall to make sure its sustained. 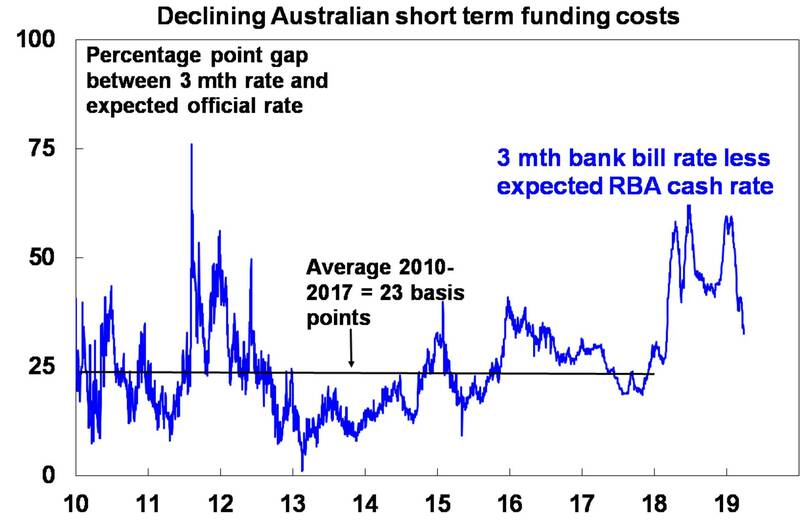 That said falling funding costs indicate that the banks will have little excuse but to pass expected RBA rate cuts on in full. In the US, the focus is likely to be on March jobs data (due Friday) which is expected to show a rebound in payroll growth to 175,000 after the depressed 20,000 gain reported for February, unemployment remaining at 3.8% and wages growth remaining at 3.4% year on year. Meanwhile, expect a solid rise in February retail sales and the manufacturing conditions ISM remaining around the 54 level (both due Monday), a further gain in underlying durable goods orders (Tuesday) and a fall back in the non-manufacturing conditions ISM index to around 58 (Wednesday). Eurozone core inflation (Monday) is likely to have remained stuck around 1%yoy in March and unemployment for February (also Monday) is likely to be unchanged at 7.8%. In Australia the focus will be on Tuesday’s Federal Budget but just before that, the RBA is likely to announce that its left interest rates on hold again for the 29th meeting (or 32nd month) in a row and that it retains a balanced or neutral bias in terms of the outlook for rates. While most economic data has been soft over the last month and there is a case to cut rates now to avoid having to do more later, the RBA still appears to be reasonably upbeat on the outlook, the further fall in the unemployment rate to 4.9% has arguably given it a bit more breathing space and it probably wants to see what sort of fiscal stimulus comes out of the budget and the election. Ultimately, it’s likely to see the RBA cutting rates but the first move looks unlikely to come until around June or July. On the data front expect CoreLogic data (Monday) to show another fall in house prices for March, the March NAB business survey (also Monday) to show continued softness in conditions and confidence, February building approvals (Tuesday) to fall 1.5%, retail sales to rise 0.2% and the trade surplus (both Wednesday) to fall back to around $4bn. Various business conditions PMIs will also be released. Share markets globally and in Australia – have run hard and fast from their December lows and are vulnerable to a short-term pullback. But valuations are okay, global growth is expected to improve into the second half of the year, monetary and fiscal policy has become more supportive of markets and the trade war threat is receding all of which should support decent gains for share markets through 2019 as a whole. The $A is likely to fall into the $US0.60s as the gap between the RBA’s cash rate and the US Fed Funds rate will likely push further into negative territory as the RBA moves to cut rates. Being short the $A remains a good hedge against things going wrong globally.